When Iman and I attended the ultrasound, we were so excited to find out our baby's gender. But of course, we would like to know if our baby is healthy and how the baby is in my tummy. 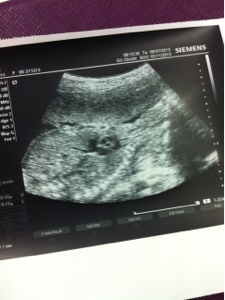 Alhamdulillah.. Baby no.2 is doing great. When Dear Husband asked the Doc if we can find out our baby's gender, she said.. "Most likely a xxxxx" but I am not satisfied with her answer. I'm not convinced yet truth to be told. We'll find out again soon, insya Allah.